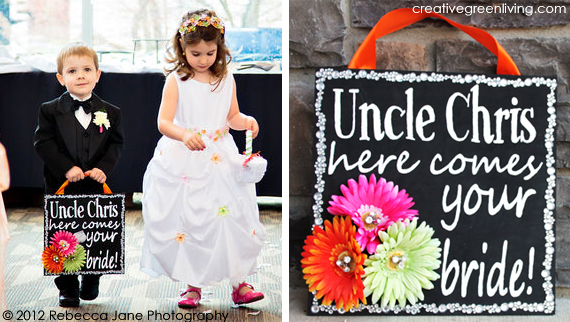 Last year, some of my favorite crafting happened for my brother and sister-in-law's wedding. They had a really pretty "black and bright" theme that not only looked great in pictures but was really fun to craft for. 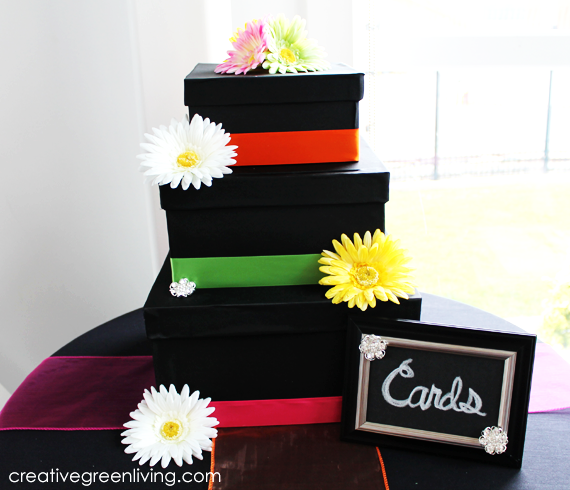 This card box not only looks great but you can keep using the boxes long after the wedding is done. Wedding crafts that aren't "use once and throw away?" 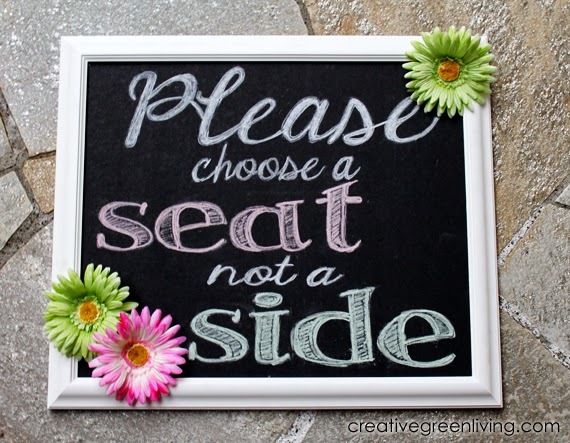 - Definitely what green weddings are about! 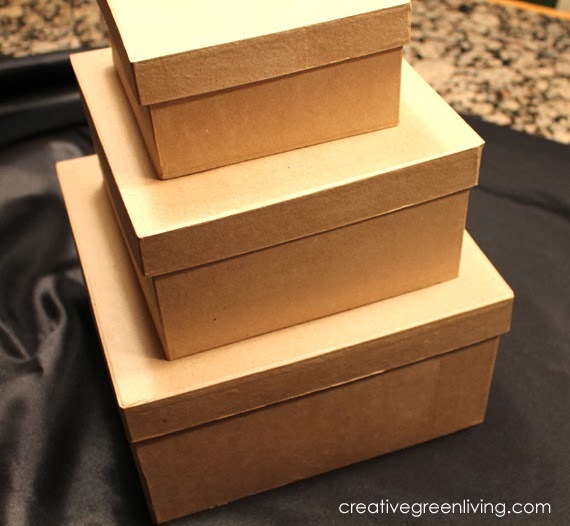 Stack your boxes together as you would like them to appear to be sure you like the scale and placement of the boxes. For this box, the top box was a bit too small to fit cards, so the second box down was serving as the receiving portion of the box. 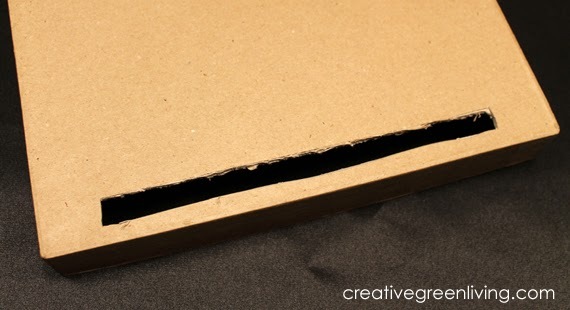 Use your craft knife to cut a slit near the edge of the lid of the second box. 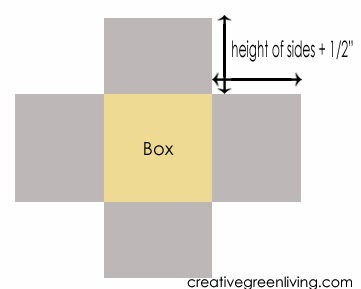 The length of each portion of the cross coming out from side of the box should be equal to the height of the box plus 1/2 inch. So if the box sides are 5 inches tall, the fabric should be cut to extend beyond the side of the box by 5.5 inches. 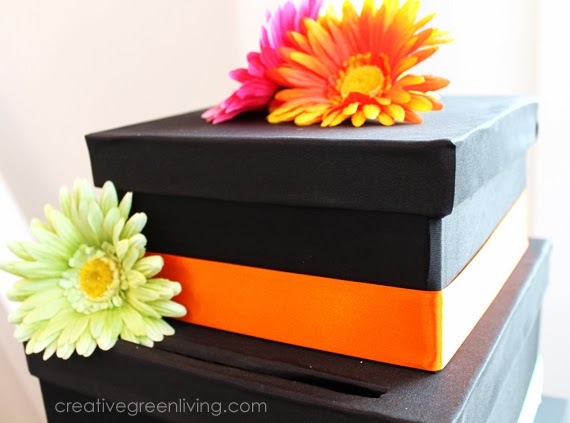 Remove the box from the fabric and spray with the spray adhesive (I recommend doing this on a large piece of scrap cardboard outside). Place the fabric sprayed side up and center the box on the fabric. Pull the fabric taught and pull each piece of the cross up the side of the box, wrapping the last half inch over the edge. Repeat this process with each box and lid. On the lid of the middle box with the slit for cards, cover the lid as described above. Once covered, flip box to the back side and cut a slit on the fabric where it shows through the slit in the box. Fold the excess fabric around to the inside of the box. 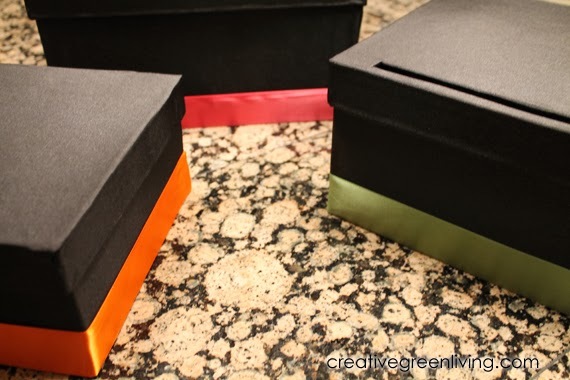 Use hot glue to adhere a strip of ribbon around the base of each box. 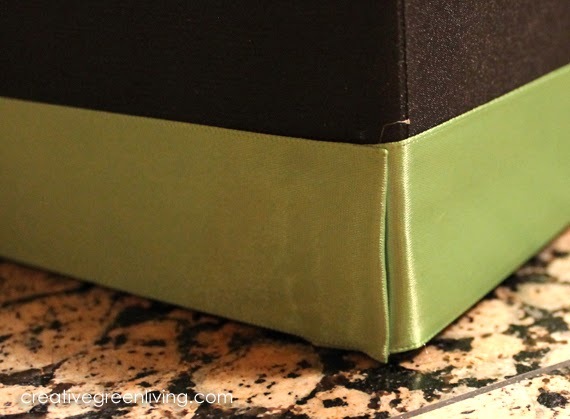 To assure a finished look, be sure to fold the final 1/2" of ribbon in on itself before adhering to the box to overlap where the ribbon started. 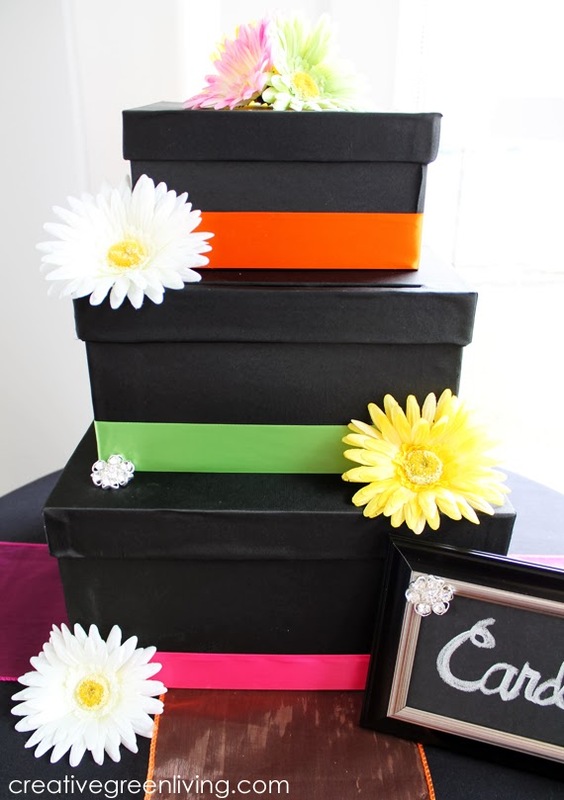 To maximize the future usefulness of the boxes, I did not attach the flowers or rhinestone buttons to the box. I just backed 3 big flowers up against each other on top and laid a flower on alternating corners on the way up the box. 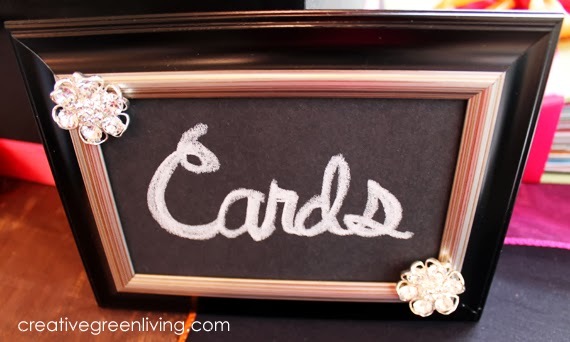 To make the little framed sign, I simply used a little scrap of the black foam core from the Seating Sign and wrote "Cards" in a script with chalk. Then I used hot glue to attach rhinestone buttons to two of the corners. Hi! This looks superb! Just curious, did you stick the boxes on top of each other to ensure they wouldn't topple? Thanks! No, they are set on top of each other without adhesive. I was not worried about them toppling and they stayed just fine.